1. Put the stock pot in a medium pan with 1 litre just-boiled water; whisk until dissolved. Add 3 whole tarragon sprigs, bring to the boil, then take off the heat. Quickly put the chicken breasts in the hot stock, cover and leave for 15 minutes, turning halfway. 2. Lift the chicken out of the pan and rest on a plate, loosely covered with a sheet of foil. Discard the tarragon, bring the stock to a simmer and add the potatoes and carrots. Simmer for 5 minutes, then add the leeks and simmer for 5 minutes more. 3. Add the peas and simmer for a final 2 minutes. Take off the heat and stir through the crème fraîche, chopped tarragon and lemon zest and juice; season. Slice the chicken and divide between bowls, then ladle over the veg and broth. 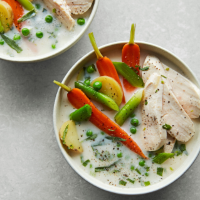 As chicken breast is so lean, poaching is a gentle cooking technique that helps keep the meat as tender as possible. This recipe was first published in Thu Mar 29 10:45:42 BST 2018.